As you may have read from my Friday post, I spent my weekend in sunny LA. I lived in LA for several years so I always miss the sunshine and warmth. Though I also seemed to miss the good weather in the Bay Area this weekend too (darn! The City is so pretty when it's nice out!). I hope you all had a good break this weekend. Did you travel or stay local? Are any of you excited for the upcoming Oscars? I still have to catch some movies before Sunday (Lincoln and Silver Lining Playbook namely) but I can't wait to see the award show! I now want those flats... :) Such a cute look! Wow, I love this cute star print blouse, great! Glad you enjoyed yourself in la! We had some amazing weather.. I'm sure sf was stunning (insert jealous tone, haha). P.s. those jeans look amazing on you! 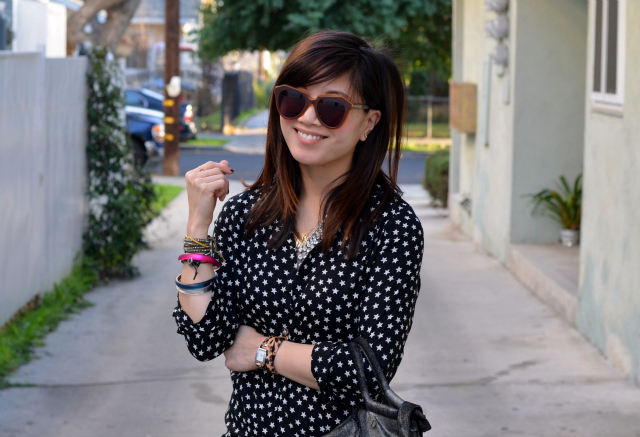 Love your top and I love your leopard watch! those flats are adorable, nancy! This star print blouse is absolutely gorgeous, love it with the skinnies!! I am jealous you got to be in LA enjoying the sunshine!! I was in LA too on the weekend. We could have bumped into each other LOL. What amazing weather. I'm so depressed to be back home now. Love the polka dots and the colour on the shoes! Super cute! Love that fun top! I love this adorable shirt! I've visited LA once, but I didn't get the chance to spend a lot of time there, so I've always wanted to make a trip back. Maybe someday! I am completely in love with those shoes! Anyway, loving those fun print flats and the blouse you're wearing! I will probably watch the Oscar, but I didn't see any of the movies. Love the look. I bet the weather was amazing! Cute outfit Nancy and I love those Prabal Gurung for Target shoes. They are on point! I can't wait to see the winners of the Oscars and of course the fashion. I love how you cuffed your jeans and it looks like someone did a little shopping with the Prabal Gurung x Target collection hehe! I love the colorful florals from that line! 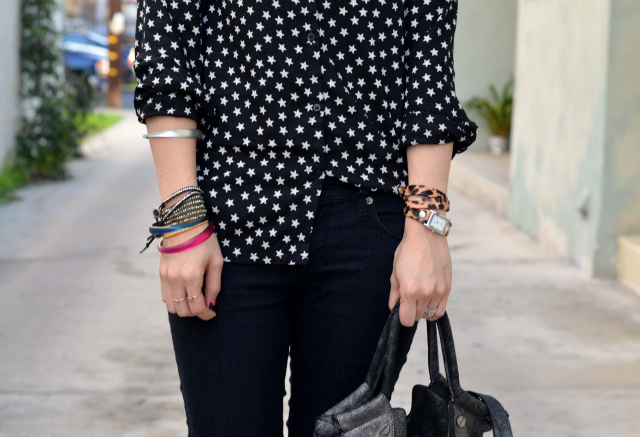 love the pattern mixing and how you styled those flats! target is calling my name lol! 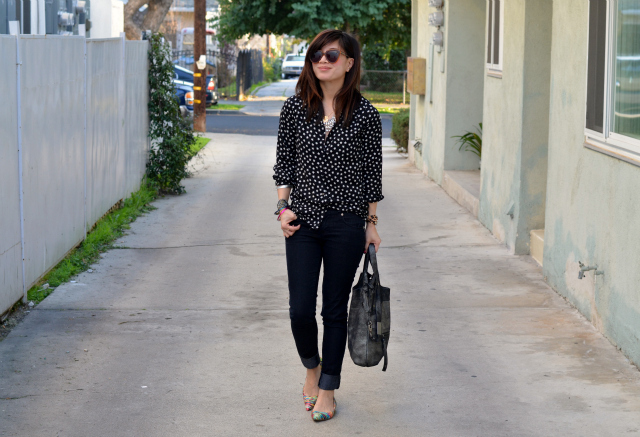 Oh my those flats, your top and glasses I'm in love! It's rainy in LA today! Love the pops of color from your shoes and jewelry. Cute outfit! Oh my gosh what a great outfit! I am your newest follower for sure. Love this starry outfit :-) Those sunglasses are so glam! Such a fun casual look! I love your flats! So envious of the lovely sunny weather on the West Coast. It's been freezing in NYC. Love this look! I absolutely love how you styled the Prabal flats. The one aspect that really makes me love this look are the sunglasses. :) Great accessory! I wished I could fit in the kids section - sometimes they have the cutest print and at a lower price. Love how you added the colors with the flats. I picked up the heel version and can't wait to wear them. It was so nice in LA this weekend, but it literally dropped 30 degrees. Boo. Love this outfit Nancy! Always so chic my dear:)! Okay. So when I saw the Prabal flats at Target I past them up, but they look so cute on you! I just know I wouldn't be able to pull them off, but I like how you wore them! I want everything in your outfit... Right down to the nails. Fabulous! oh!!! You wear these flats so well! And I love that top - it's perfect on you. I would love to spend my day in LA - seriously, that sounds amazing - it looks like spring there! I love the shape of your sunglasses!